In Ireland, many homes still have antiquated boiler systems that can actually blow up when left running for too long. But what about a modern home with an up-to-date water heater system? While far safer than traditional boilers, even that brand new AO Smith isn’t perfect. Here’s everything you need to know about the risk of water heater explosions. Can a Water Heater Explode? What Causes a Water Heater Explosion? Your water heater has a limited lifespan during which it deals with a lot of pressure. Malfunctioning water heaters run a much higher chance risk of exploding, as do ones that are not being maintained or replaced regularly. When a heater fails or even explodes, it can cause extensive water damage to your home. There are multiple potential causes of a heater explosion, but pressure is the main threat. A broken T&P valve, too much sediment, or a bad anode rod are all dangers that can lead to a pressure explosion. Another potential cause can be a gas leak, which creates a major fire risk. Depending upon the culprit, you can get different symptoms. For example, a sulfur or rotten egg smell coming from outside the tank is most certainly a gas leak, while a a sulfur smell coming from your faucets suggest a colony of microbes in the tank. Brown water can also suggest rust or sediment buildup, as will pings in the pipes. Proper maintenance and replacing the water heater when issues or leaks start occurring on a frequent basis are both good ways to prevent a major explosion. 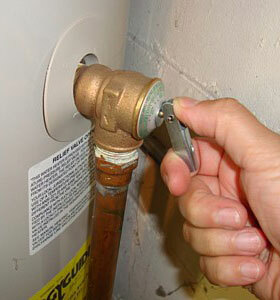 There are a few easy ways to maintain your heater, and none of them require a plumber, unless you decide you want one. Barring the discovery of symptoms, a water heater needs to be thoroughly checked at least once per year and routine maintenance should be done at that time to keep the heater in peak condition. The temperature and pressure relief valve (also known as a TPR or T&P) is an important part of the water heater and is generally located at the top or high on the side. Testing the valve twice per year is quick and easy. Just put a bucket under the valve, wear clothing that protects against any splashed scalding water, and flip the valve switch up for approximately five seconds. It should be able to release water during the check. Replace the TPR valve immediately if it appears to be malfunctioning. As tempting as it is to keep the thermostat at its highest setting, this can actually shorten the lifespan of both your water heater and the TPR valve. In most cases, I recommend setting your thermostat to 130 degrees and avoid going higher than 140. Hot water creates more pressure, which can force the TPR valve to activate frequently, wearing it down and ultimately leaking hot water all over the floor. The anode is a sacrificial rod which attracts corrosive agents in your tank’s water. As a result, the rod rusts and decomposes instead of the water heater’s walls. 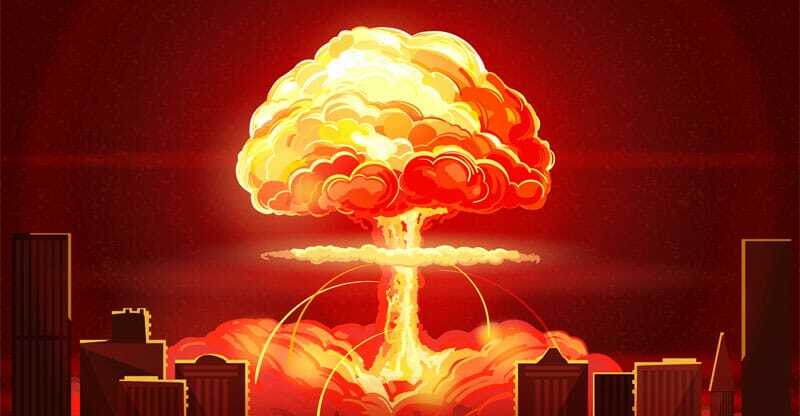 A tank explosion is possible when the walls of the tank get too thin and eventually rupture. You should check the anode yearly and replace as necessary. Note that there are several types of anode rod, so you may wish to invest in a rod which best suits your household needs. In the event you smell sulfur near a gas water heater, it’s important to shut it off immediately. This could be a major fire hazard and explosion risk. Do not turn the gas back on until the gas leak is taken care of. Professional help is recommended but if you’ve narrowed it down to a faulty gas control valve or it’s connection, the controls are located entirely on the outside of the tank. This makes it fairly easy to replace a defective gas control valve. Note that water heaters can also release carbon monoxide when defective. This odorless gas causes a number of symptoms, such as dizziness and trouble concentrating. Too much is deadly, so it’s suggested to keep a carbon monoxide detector near the water heater in case of escaping CO2 gas. Over time, sediment can build up in the tank, causing the water temperature to become uneven and increasing tank pressure. Flushing out the tank yearly can greatly reduce these dangers and allow your anode to work more efficiently. The process takes longer than the other maintenance tasks on this list, but the results can often literally be felt. While not always possible, if you have a gas water heater, it should ideally be installed 18 inches above floor level. The reason is that various liquids such as gasoline, paint thinner, lacquer, brake cleaner, contact cement, and other flammable materials may be stored in the same area (ie: garage). If these materials are being used near a water heater or left unsealed, the vapors can reach the gas control valve and result in an explosion. Since most flammable vapors stay close to the ground, risk of flammable vapor event is greatly reduced if you water heater sits off the ground. Is Your Water Heater Leaking From the Bottom?